Metal Detection Services have been in a partnership with CEIA UK since the summer of 2018, this partnership allows CEIA UK to provide security metal detection into industrial manufacturers of food, pharmaceuticals and textiles across the UK, with the help of MDS. CEIA UK are based in Alcester, Warwickshire and are the UK agent for CEIA’s security division. 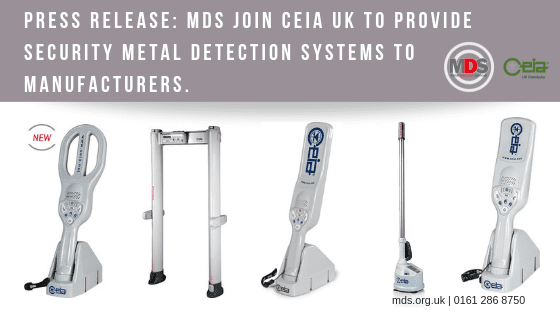 MDS are based in Sale, Manchester and are the UK distributor for CEIA’s industrial metal detectors. CEIA provide metal detectors into a number of industries including a huge percentage of the world’s airports and correctional facilities. A number of food manufacturing sites are adopting this type of detector to ensure unwanted items are not being taken onto, or removed from the factory floor. Taking into account the advancements and dependency on technology for many staff, actions need to be taken in order to protect both the employees and the company’s brand. These metal detectors ensure the safety from potential threats being brought inside, as well as protecting them from the threat of items of value being taken out. There are a number of different detector options available, all of which provide different levels of detection and have differing footprints. For more information, and to organise a free trial contact MDS on 0161 286 8755.